I can remember as a child seeing the commercials for Luray Caverns in Virginia advertising the beauty and splendor of stalagmites and stalactites but the first time I ever stepped in a cave was thousands of miles away in Vietnam. The first cave we visited was Paradise Cave which was only found in 2005 despite being 100’s of millions of years old. The cave is so big you could land a jumbo jet inside. The stalactites and stalagmites are so enormous it took thousands of years to build. The walls of paradise cave swirled with burnt oranges and sepia tinged yellows. I felt like I had been transported into another dimension. Vietnam was blowing my mind in terms of the diversity in its geography. Hanoi was downright chilly the couple days that I had been there but as I moved south the temperate and humidity began to rise slowly. Thankfully the cave was cool so I had no trouble admiring all of the interesting patterns and designs that nature had created. After roaming around Paradise Cave we headed to our final destination Phong Nha Cave- which was known for being the longest wet cave or river cave in the world. Our boat sailed through a mouth like opening in the limestone mountain. It felt like I was crossed into Hades- the water below me the river Styx. As the cave swallowed us I realized there is truly an entire world underground. 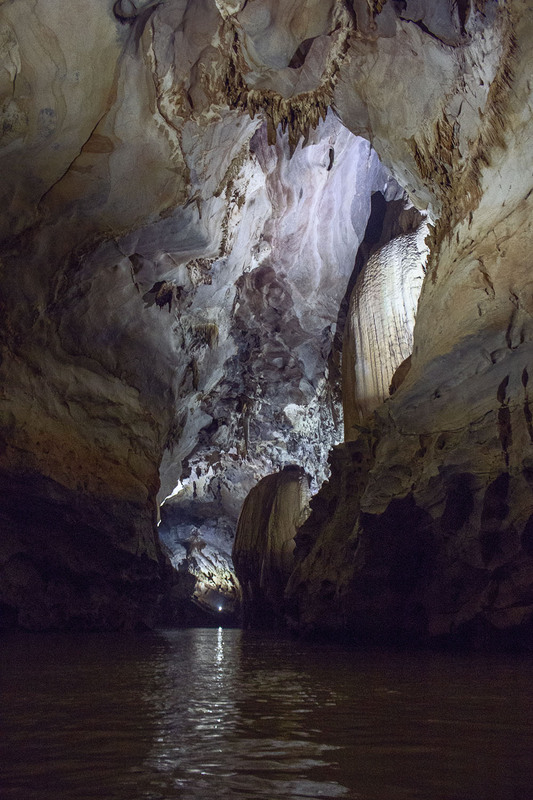 Some of the largest cave systems in the world have jungles and lakes and weather patterns. I wonder what other secrets and wonders are hidden deep in the earth’s crust. For example this cave was used as a hospital and to store equipment during the American War.